This guide explains how to create a switch accessible JAMMA games machine for use at home. 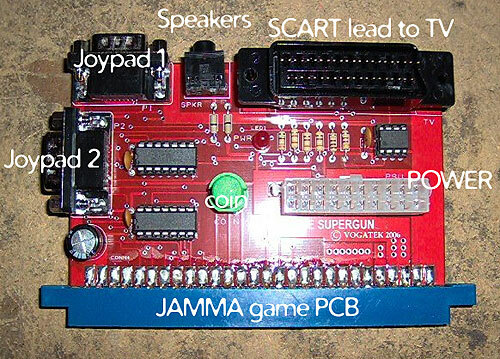 JAMMA is an arcade standard wiring system that means you can swap game PCBs with the minimum of hassle, a little like giant sized game cartridges. Three of the finest one switch games, Star Trigon, Uo Poko and Mushihime-Tama are JAMMA PCBs, and are the main reasons for this D.I.Y. page. SAFETY: Always use adapted equipment under supervision, and disconnect power when not in use. These adaptations are at your own risk. Good luck! 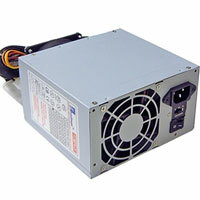 Most of the basic components used here, such as the ATX Power Supply are commonly available from stores such as Maplin Electronics. 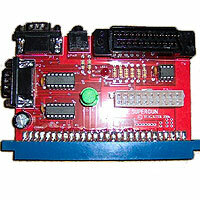 The core "SuperGun" PCB is available from Vogatek and often from eBay. N.B.If you contact Romeo Cervi at Vogatek he can replace the PCB mounted coin button, with a 3.5mm socket for plug in switch control, which I highly recommend if you are playing Uo Poko. 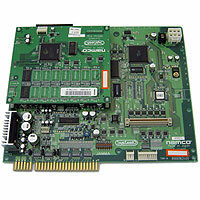 The JAMMA PCBs will likely prove the most difficult items to source. JAMMA+ forums may be a good place to start as well as searching international eBay auctions using the advanced search options. Coin-op Express and Excellent Com in Hong Kong are a great source of JAMMA PCBs. It's also worth trying Google and Yahoo Auctions Japan. If you can't speak Japanese, you may consider using a shopping service, such as JAA. Good luck! Soldering iron (15 to 30 Watt power); thin solder; soldering flux; desoldering braid; thin wire (e.g 7strand 0.2mm); Shrink Wrap (optional). You need to think carefully about what game controls you want to wire your switch sockets to, as the Megadrive controller has limited space for these. Star Trigon. START = start the game. A, B or C (just choose one) = launch. Set the game to FREE PLAY By flicking the first DIP switch to enter the set-up menu. Uo Poko. START = start the game. DOWN = pull spring. 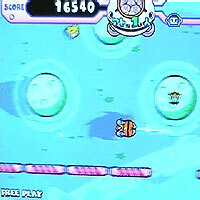 You will need to insert (virtual) coins with this game, as there is no FREE PLAY option. 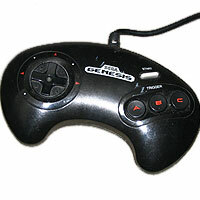 You can wire 3.5mm switch sockets directly to the buttons, by using the same type of technique as seen with the Talking Tins and especially the Sega Saturn Joypad adaptation.